Tokyo (February 21, 2008) – Konica Minolta Opto, Inc. (president: Takashi Matsumaru) is pleased to announce that its new production subsidiary, Konica Minolta Glass Tech (M) Sdn. Bhd., began production of the glass substrates for hard disk drives (HDDs) . The construction of the new plant started in March 2007. HDDs are magnetic storage units for such products as personal computers and mobile audio players. The essential component of HDD is disk substrate made of either aluminum or glass. Compared with aluminum, glass substrate excels in heat resistance and shockproof, and is suitable for higher density storage media. For these reasons, it is more than ever being used in various digital consumer products, such as laptop personal computers. 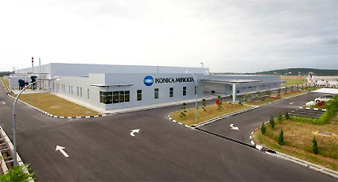 Since 1990s, Konica Minolta is engaged in glass substrates business for HDDs. Based on the years of experience in the development and manufacturing technologies of glass lenses, Konica Minolta streamlined development and manufacturing operations from glass composition design to melting, pressing, and polishing. Although, we have been manufacturing glass substrates in our Japanese subsidiary, Konica Minolta Glass Tech Co., Ltd., we decided to establish a new manufacturing facility in order to meet with the increasing demand of HDDs due to penetration of digital consumer products and shift to higher density storage media. Numerous HDD related manufacturers are currently expanding into Southeast Asia. By constructing manufacturing site in Malaysia, we have confidence in that we can shorten delivery time to better serve our customers. Initially, we will begin our production from one million disks per month. Looking toward the future, with a view to increasing our production capacity to three million disks per month, we aim to ever more expand our business in this field. 100% Konica Minolta Opto, Inc.